I cooked my first meal from my new favorite blogger, ThePioneerWoman, and the meal turned out pretty well. 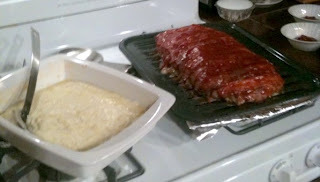 I made the meatloaf WAY too big and the middle was a tad underdone but the mashed potatoes were spectacular! And this was the end of my Friday... The Pioneer Woman's Cookbook is not only a cookbook with beautiful photos, it is a wonderful story about her life. I read it cover to cover and enjoyed every minute of it. I know, I gush, but if you like such things, buy it!